I prefer calling it “train station gelato” to “bad gelato”. “Bad” sounds like a value judgement. Or as if you’re not going to eat it anyway. When I lived in Roma, I had 2 favorite gelato places, primarily because I was a poor young adult that couldn’t afford the top-notch places. One was “Old Bridge” right off of Piazza Risorgamento, and the other was “Giovanni Fassi” in the Esquilino neighborhood (right down the street from my apartment.) Given the number of natives in both places, they seemed pretty good. Capogiro in Philadelphia is my go-to place for gelato. Fantastic quality and unusual flavors. They use seasonal and local ingredients.The flavors change frequently, though there are some constants, like bitter chocolate and stracciatella. You can even get it shipped though I haven’t tried that. There’s three locations in Philadelphia if I recall correctly. Most of my trips to Philly usually end up with me popping by Capogiro. Check out Gelatiamo in Seattle. It’s some of the best gelato outside of Italy that I’ve had! I wasn’t aware of these techniques for judging good gelato the last time I was there, so I don’t know how well it would stand up, but some the best gelato I’ve ever had (by flavor) was at the Gelato Bar at 1936 Hillhurst Ave in the Los Feliz neighborhood of Los Angeles. I recall the woman behind the counter talking about how her husband studied how to make good gelato in Italy, and about how much time and effort goes into concentrating the flavors. I had an unbelievable pear and a fantastic Greek yogurt/honey; the tartness of the Greek yogurt complimented the sweetness of the pear nicely. A friend of mine was in love with their grapefruit sorbetto on that same trip. Please check out Gorgeous Gelato in Portland, ME! Your article includes a lot of subtleties I never realized until now, but my own personal “gelato test” has always been NOCCIOLA, and Gorgeous Gelato’s is some of the best I’ve ever had. In fact it’s hard for me to try other flavors there, because I love their nocciola so much! Owners are from Milan and I believe their product would meet many, if not all, of your criteria for excellence. If you like chocolate, only Venchi is acceptable. They have different % of chocolate (e.g. 75%). Additionally, they make it with milk or with water. As you can expect, they taste very different. Finally, they make it with different chocolates (blended) or from a single cocoa bean. In Rome they are in via della Croce (next to Spanish steps). In my opinion, nothing else is even close. Try Dolche Amore in Vancouver, BC. It’s on Commercial Drive (the old Italian, working-class sector of the city), and although new, it’s quite good! Seasonal flavors, proper colors, flat bins, no decorative syrup. I have no idea about the lemon because I was so overwhelmed by the cranberry and allspice flavors that I felt no need to order more. You should try Morano Gelato in Hanover, NH if you find yourself anywhere near Dartmouth College. 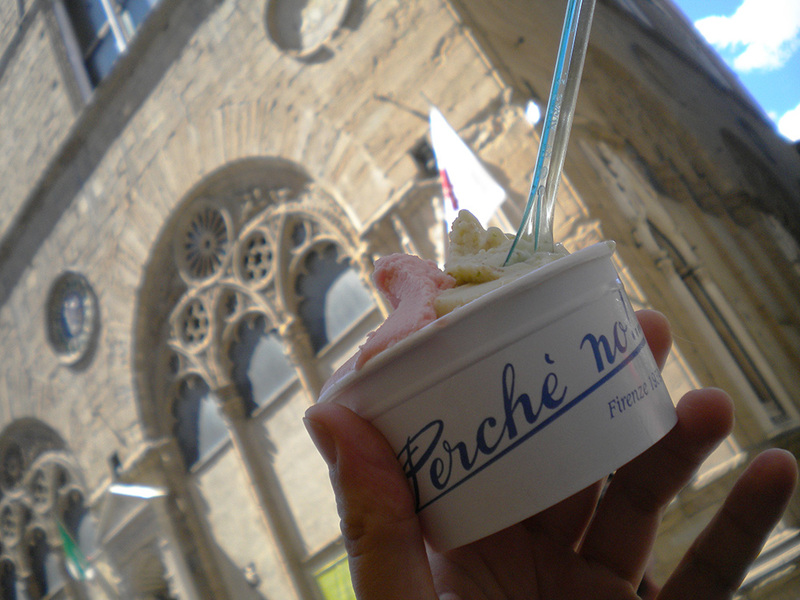 Forbes Magazine wrote it up as the best gelato in the country. The founder spent 6 years making gelato in Florence. I’ll try some of the other places in these comments, but Morano Gelato passes all of the tests in this article with flying colors and then some! Isn’t that the same one he wrote about in this article? Alotto Gelato in Portland , OR, they started at a farmer’s market, use local produce and come closest to the magic that emptied my pockets in Spain. The speckles of real vanilla bean in the vanilla is also a good, though not sufficient, sign. When I lived in Testaccio, the old butcher’s quarter of Rome, the neighbourhood boasted (still does) one of the best Pizza joints in the entire city, Remo’s, and a very fine gelateria just across the way, now gone. That was one fine piazza. I agree with Beer & Skittles…Gelatiamo in Seattle is divine! Owner is from Italy and learned from the best! 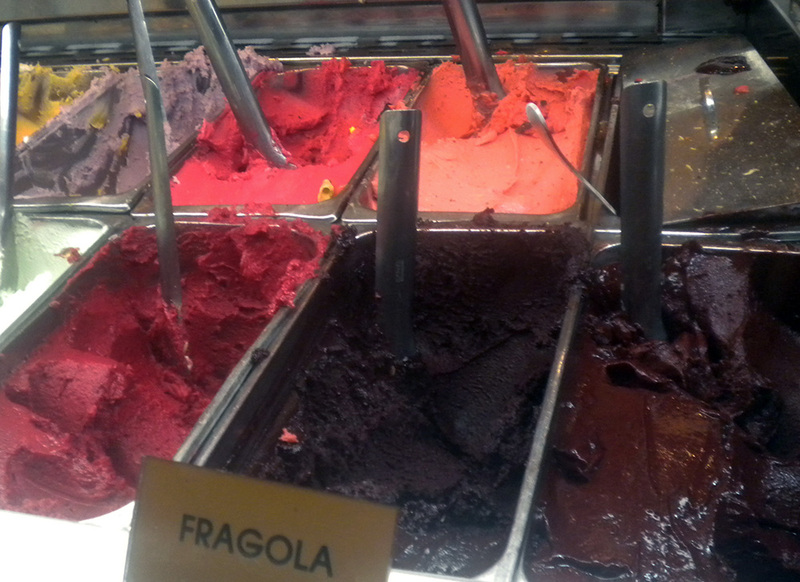 I live in a gelato desert as far as I know. I’ve never seen gelato in China. Gotta go to Hong Kong if I want some, and even then I’d be lucky to find the inferior kind. Damn you geloto-less China, damn you! Gelateria dei Neri, Florence. They won best dark chocolate of the year, but you must try their profiterole semmifreddo. Il Re Gelato, Florence. The owner is a master of Sicilian dessert, and everything in his shop is delicious. His sicilian gelato is not only healthier than most gelato, his fruit flavors are made with the highest quality and freshness that one’s tongue cannot refuse! Also, his presentation was beautiful and by far the prettiest gelato I’ve seen. Morano Gelato of Hanover, NH is the best gelato outside of Italy. 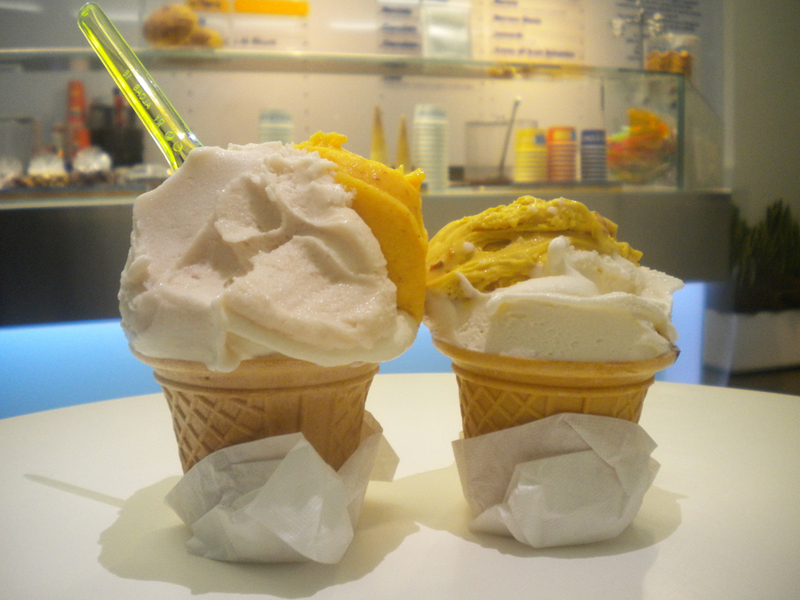 I have had both Grom and Amorino Gelato in NYC, although both have good gelato, Morano Gelato is better. Forbes magazine acclaimed Morano to be the best gelato outside of Italy, and I agree. 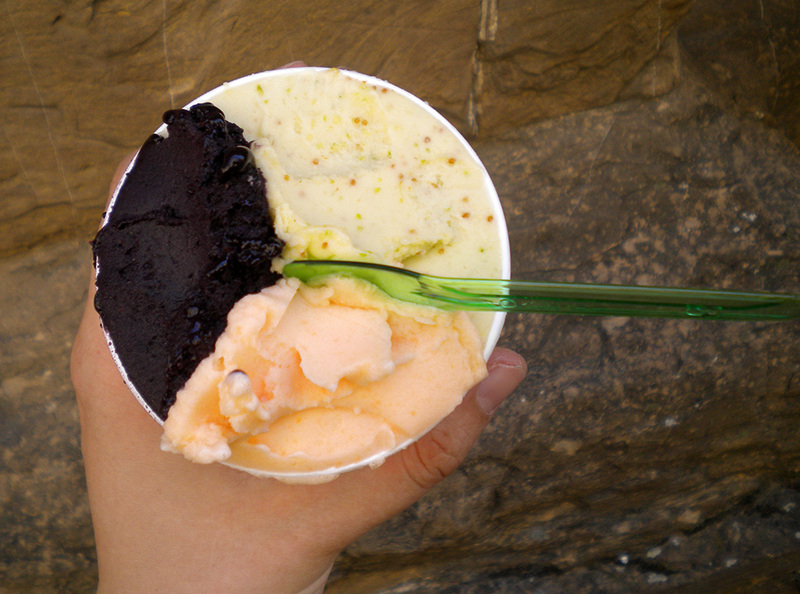 The gelato is made onsite daily, flavors change every day, and the flavors are also seasonal. 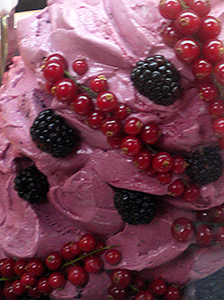 Morano Gelato uses local dairy, fruit, and berries. The fruit is picked fresh and in the gelato the next day. Also, they source out of Italy for the finest chocolate, and nuts. Their Pistacchio is made only from Sicilian pistachios, because they are known to be the best in the world. That goes for the Nocciola, too, they only use hazelnuts from the Piedmont region because they are known to be the highest quality. Morano Gelato is the best! Thanks for your article! Especially for your last paragraph, which is v helpful. I’ve had to make radical changes to my diet for health reasons over the last couple of years, and many foods have been labelled “contraband”. I still eat them from time to time but have adopted a sort of “smaller amount, but better quality” rule. Problem with that is you can find yourself edging further and further towards food puritanism, and losing a lot of fun along the way! Good points all (although I might disagree with the practice of measuring gelato against sorbetto), but the biggest problem I have with gelati is when it’s been sitting around and develops a grainy consistency, which is hard to determine visually. 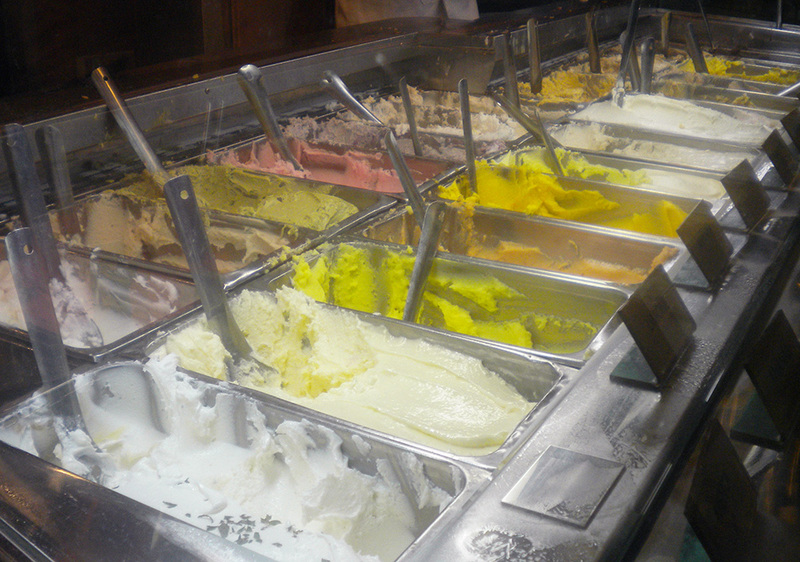 If you’re in Toronto I recommend Capitano’s on Yonge st. All their Gelato passes the test and is made in house. They also make great burgers oddly enough. I haven’t checked whether their gelato passes your tests, but as someone who adores gelato, I can say that (a) these two places make taste buds do a happy dance and break out in song, and (b) are long-adored favourites in the city, far and away more popular than other locations. In Ottawa: I was a long-time fan of Piccolo Grande (http://www.piccologrande.ca/), in the Byward Market. Their gelato compared well to the best of what I enjoyed in Italy. And then came Stella Luna, in Old Ottawa South (on Bank Street) a year ago– even better than Piccolo Grande. Delicious fresh-tasting strong pure flavours, great texture. Stella Luna (http://www.slgelato.com/) also has good coffee and sandwiches. Frost Gelato, Tucson, Phoenix, and soon to open in Albuquerque. Truly amazing quality and the original cook-Nazario has created flavor unparalled. Salted Caramel and Pistachio are exquisite. I have never had a bad flavor and have probably tried them all. This is a fascinating and thorough article! Thank you! I have recently moved away from a favorite gelato maker of mine, Madisano’s in Cincinnati. Pitango in the DC metro area is the best! They pass the presentation test (stored under round metal lids, not piled up) and offer Crema (I would assume this is the equivalant of fior di panna) and Nocciola, as well as a variety of seasonal flavors.The gelato is creamy and soft just as it should be. It is definitely the closest you can get to the gelato in Italy, and hands-down the best gelato in D.C. Many thanks, everyone, for the many suggestions. I will compile them next chance I get. I had not heard of Pitango but it does sound good. Good crema is a great sign, though crema is not, in fact, equivalent to fior di panna. Crema is custard flavor, based on the kind of sweet yellow egg-based custard you get as a filling in pasteries. By adding the egg custard element, crema becomes something closer to what is called French Vanilla in the US, and it can conceal inferior quality milk the same way vanilla does in ice cream. Crema is one of the most staple gelato flavors, and between them crema and fior di panna occupy the position in the gelato world that vanilla does in the ice cream world. Every good gelato place has a reliable and rich crema, and some show off by having special varieties of crema with subtle addatives like citrus extract, roasted pine nuts, basil or liqeur. It is a reliable flavor, often good even at mediocre places and delightful at good ones, but becuase it is an easier flavor to ahcieve, crema is not as sure a test of a gelateria’s quality as fior di panna. La Divina makes gelato and sorbetto from scratch in New Orleans, LA. Grass fed milk and seasonal, local ingredients. Signature flavors include creme brulee, bourbon pecan, chocolate azteca. Pitango in DC is great, though incredibly expensive. I think their smallest size will cost you in excess of $5. Also, their crema flavor refers to espresso crema, and it is delightful. Dolcezza is another place worth trying. Pazzo Gelato in Sliver Lake, CA (Los Angeles). Amazing job with the fruit sorbettos, always keeps it seasonal. Strawberry sorbet with chocolate chunks, chocolate hazelnut gelato, pear sorbet. The bar opposite the train station in Chiusi (SI) has the most astounding nut gelati: pure Hazel nut or Almond but also the ‘Lars Porsenna’ (named after the first Etruscan king of Roma). Unrivalled for the quality of ingredients. Drop in there whilst changing trains from Siena to Rome. Pitango has it all but he flavors are weak at best. Gelateria Naia in Berkeley and North Beach, San Francisco (and in freezer cases all over the Bay Area, mostly in Whole Foods). 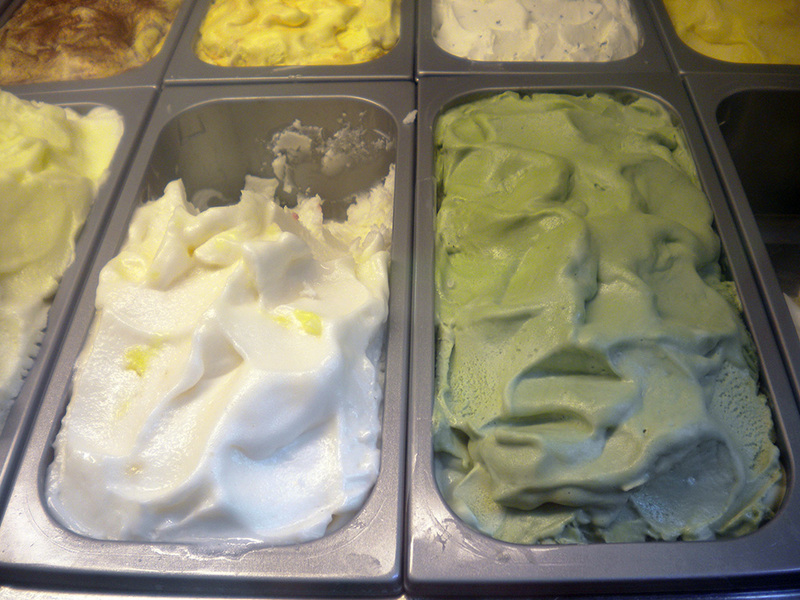 All natural, high-quality gelato, including an impressive range of sorbetti and soy-based concoctions. Low, flat-packed product in metal tins with flat lids. Cheerful decor in oranges and yellows and little cycling caps on the scoopers. Cash only; have they never heard of Square? Good seasonal flavors and an emphasis on locally sourced ingredients: chocolate from Tcho, tea from Numi, coffee beans from Blue Bottle. An interesting selection of ever-changing innovative flavors: rose, Earl Grey, jasmine, marzipan, ACE (energy drinks from Europe), and the “savory” line, which, last time I was there, was comprised solely of black sesame and saffron, but which the scooper told me was going to be expanded. But then I moved, so who knows. They’ve expanded into gelato bars; I don’t quite know how that works, because they’re much harder than the ideal consistency of gelato, but the flavors are quite tempting and they seem popular in the Bay Area for parties and events. But the best part is the cute little trinkets–a demitasse of espresso beans, a parrot for Madagascar vanilla, a silk flower for rose–that decorate most of the flavors (the ones that aren’t just fruit, which have, duh, a fruit on them) to help you decide and remember what you want! There is a great place in Santa Fe, New Mexico called Ecco Gelato. They pass almost all the tests (nocciolla is sometimes seem, but they always have chocolate hazelnut). They use locla milk, and no premixes as I know it. On par with good Italian Gelaterias. I’ve had Pitango when in D.C. and it fascinates me, because it passes all the tests which should indicate good gelato, and yet it isn’t. I don’t know what they’re doing wrong. The colors are right, the storage is right, but it’s as though someone took a knob marked ‘flavor’ and turned it way, way down. It’s the correct flavors, just not enough of them. And yet, how do you get the right flavors in that mild a way without adding ingredients which ought to produce a different flavor? Extremely confusing experience. As is generally the case with mediocre gelato, the chocolate and coffee flavors are perfectly acceptable. For people using this thread as a reference: as both Ex Urbe and I have found from experience, the best gelato in D.C. is, weirdly enough, in the cafe in the basement between the two wings of the National Gallery of Art, the one right next to the interior waterfall. Try the apple. The two best gelato places I know of in the US are Black Dog gelato in Chicago (blackdogchicago.com) and Dolcetti Gelato (dolcettigelato.com) in Salt Lake City. Both are excellent, all natural, in-season fruit kind of places. Black Dog has a supremely talented executive chef who pushes our more exotic flavors, while I believe the family at Dolcetti apprenticed in Italy for a time. I own a Gelateria in Escondido called EscoGelato http://www.escogelato.com . 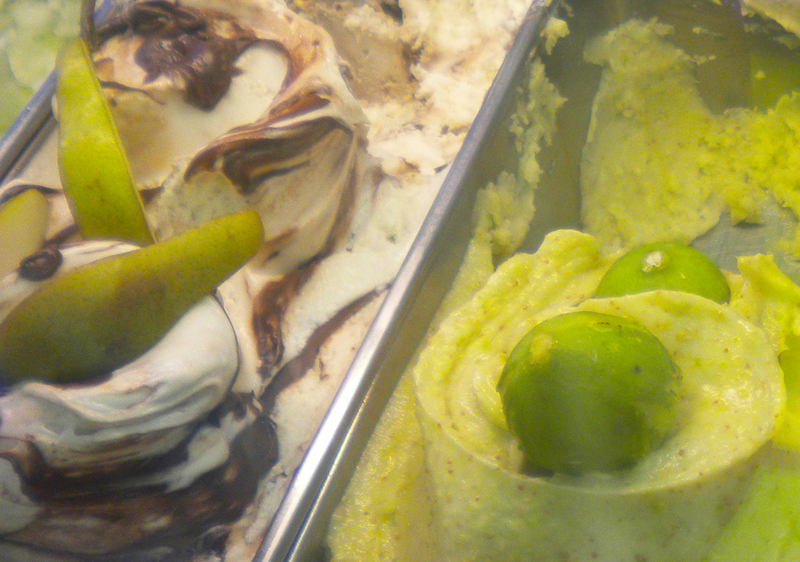 We make all our gelato fresh daily and use local products whenever they are in season. In addition to classics like pistachio, hazelnut, and stracciatella we offer flavors like almond fig, sour cream brown sugar and apricot goat cheese. We don’t use any flavor compounds and all of our flavors come from “real food”. Thank you for sharing this article…great stuff. When in Trieste, go to Zampolli. I enjoy your article greatly, because it is so rare to read something about gelato that is not just fluff. Yes, even in Italy it is not easy to find the good gelateria, but the difference is that somehow the Italians seems to know and all you have to do is ask, and they are so happy and proud to send you to the right place. In Washington DC where I live, there is one outstanding gelateria; Pitango Gelato, with two locations in town. they use all organic ingredient no flavoring or chemicals, and all their fruit sorbeti are made with fresh fruits. I think they are by far the best gelato in town, Yet, I find myself arguing with my friends that tell me that because pitango “hide” their gelato in covered bins, they would prefer to go to one of the places where they can “see what they eat”. Your article gave me the right explanation. Thanks! I like Killer E.S.P. (Espresso Sorbetto & Pie) in Old Town Alexandria just outside of DC. They switch up their flavors a lot and I always find something I love. I always get psyched when I see they have some pear or melon in the case. My wife and I stopped at Eataly in Chicago at 43 East Ohio Street a couple of weeks ago. Their gelato was quite good. I had the hazelnut (rich hazelnut flavor) and my wife the chocolate mint. A very good sign was that the mint was white rather than dyed green. 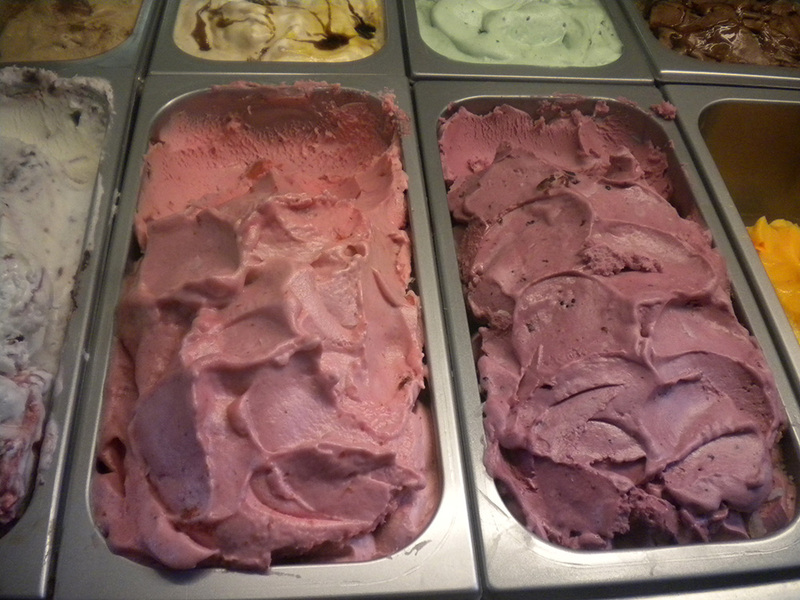 The gelato was stored in the covered bins as in your picture from Rivareno above. Their sign stated that it was produced daily in small batches. Ah, excellent, thank you. I had heard rumors of a branch of Eataly in Chicago. The other branches of Eataly I have tried have had quite reasonable, if not outstanding, gelato. I will have to try it soon myself. I’m also glad to see that I finally fixed the bug which had made it briefly impossible to comment on this thread. Let the gelato recommendations recommence! If your travels ever bring you to Greece, do try out the gelato at Le Greche, in Athens. Possibly the best gelateria here. If memory serves me well, they should pass all of your tests! Bulgarini Gelato in Altadena (LA suburbs), California. The guy’s Italian, and carries back his own pistachios from trips home because he can’t get good ones in the US. Dairy is local, and so is fruit when possible (and all the fruit is fresh). Every flavor I’ve tried is outstanding. I moved away from LA years ago and still dream about the plum-cognac flavor. This is not a recommendation, merely data. We were unfortunate enough to stop at Va Bene in Duluth, MN last week, Duluth not being very long on desserts, and I believe it’s the first gelateria I’ve been to which failed every single one of your rules. I successfully bailed out after a minor adventure with a tasting spoon. Mris sadly felt obligated to buy something since we had stopped. We agreed afterward that we should have gone to Culver’s. Not a Gelato place but if people in the Prince William/Fairfax area of VA want gelato, Mom’s Apple Pie Shop in Occoquan, VA is a Local Community store that supports local artisans and imports their gelato from a local creamery. It’s best if you get it on delivery day and I’m sorry to say I don’t recall what day that is anymore, but even when it’s been frozen a few days the flavor is excellent. I went to the Naia in North Beach, San Francisco — it was excellent, the rose, fior de latte and lemon curd were stunning, and the bosc pear suffered only from being grainy. I tasted lots of things, and they were all good — a lovely honeydew melon. The guy was absolutely enthusiastic about my desire to taste things and indeed kept suggesting more things for me to taste and combinations that might work. They struck me as Venchi level good. Weirdly, on their website they have piled up gelato, but they didn’t, it was all great. On the “bar gelato” they sell, he said it isn’t as good, but it’s better than nothing. 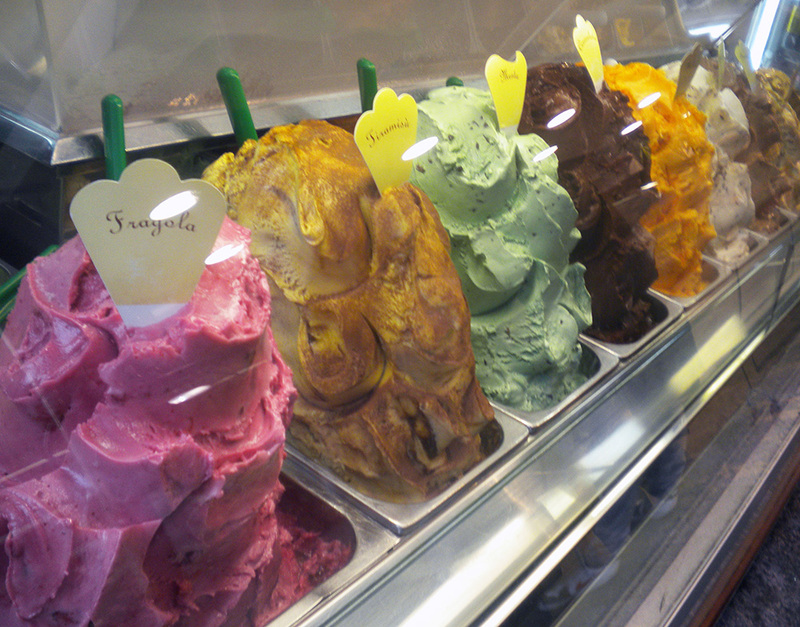 All their in-store gelato is made fresh in one location every day and taken to their three stores. I also went to Gelato Classico, on Union nearby in North Beach, where I had a perfectly nice raspberry with a pretty good caramel. Naia was better, but if I’d walked all that way and only managed to find Gelato Classico I wouldn’t have felt the walk was wasted. Thank you many times over for this guide! I found this post via Tyler Cowen over at MarginalRevolution.com. 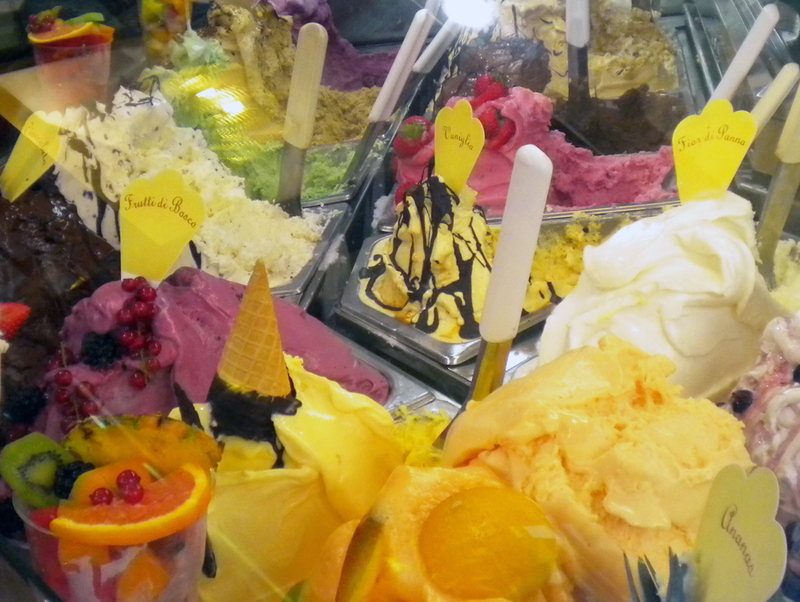 I will be in Florence in May 2016, and I plan on ingesting gelato nightly. P.S. – Your books look interesting. They were instant adds to my Amazon wish list. 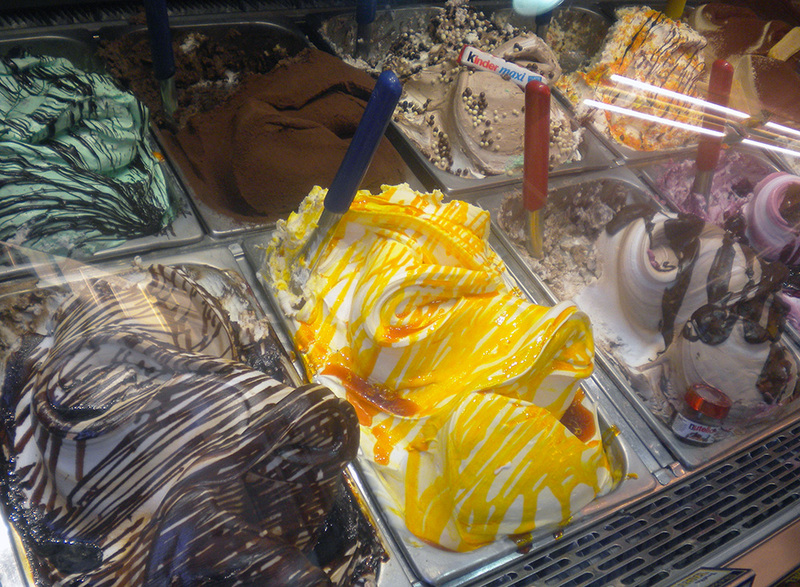 Grazie mille for your wonderful Atlas of gelato! I will be in Rome in a couple weeks and expect to profit greatly by it (almost as much as from your saint-spotting guide.) Then it’s on to Sardinia, where perhaps I’ll be able to scout out a few new places. I am somewhat shocked to see that Bobboi Natural Gelato in La Jolla (http://bobboi.com/) is not yet mentioned. As the name suggests, it is an organic/natural place. 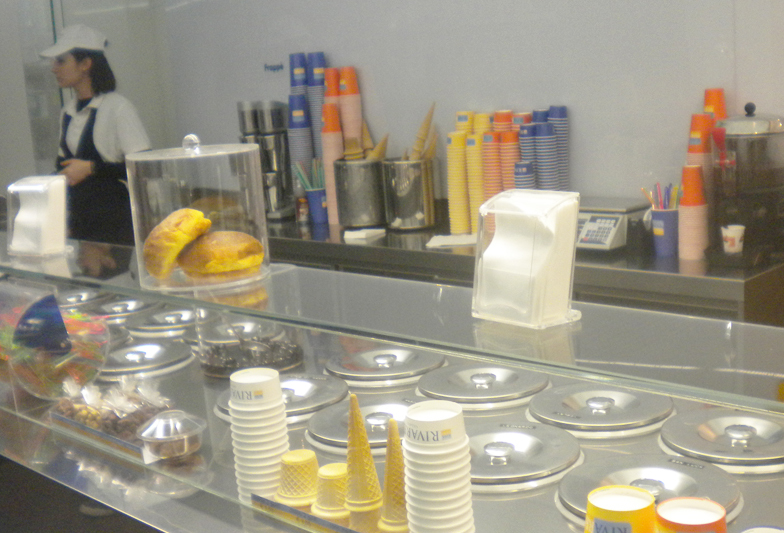 The gelato is properly stored in covered bins. The nut creams and the fruit sorbets are both of surpassing excellence. The salted caramel is weaponized pleasure stimulation. Nor can you go wrong with any of the chocolate creams or sorbets. There was no fior di latte – it doesn’t suit the American taste – but I’m confident that if there had been, it would have been superb too. Worth a detour, if you are in San Diego. Great, I’ve added it to the list! I have returned from Finland with a Finnish gelato report! Turku: not at the gelateria listed if you search for “gelato Turku.” That is basically an ice cream place. What you want is Cafe Harmonia on Brahegatan, a block or two up from the river. The apricot would make you weep. Other flavors looked promising also but I am a small eater and we were there limited time. This place also has lovely salads and pita and cakes and a place for children to play. Vaasa: Pizzeria Marco Polo. Appears to be run by a family from Naples. As we were there in May, what we had was strawberry and blueberry, utterly fresh. The strawberry was lovely, but the blueberry was beyond excellent, that little gritty peel feel and flavor, the complete opposite of artificial blueberry. Pizzas also really fabulous. Perhaps worth a mention: Don Nino, on the Via dei Pastini just east of the Pantheon. Do not confuse it with the place selling fluorescent mounds of crushed dreams next door! It is amazing that the two establishments can both thrive in such close proximity, but Italy contains many contradictions. Despite the hokey name, this place is entirely acceptable, pretty much what I think of as a standard, high-quality, small Italian gelateria. I did not actually try any of the ices, but the nocciola was very intense, with the slightly gritty texture that indicates ground hazelnuts mixed in. It was an especially marked contrast to the frankly inferior stuff served to me by Venchi the day before. Don’t get me wrong, it’s no Giolitti, and if I had time on my hands I would aim for one of the more exalted establishments. But if you are just ducking into the Pantheon and want a quick gelato without braving the queue at Giolitti, it’s just the ticket. I am sorry to report that I failed in my Sardinia mission. Please note: I am not claiming that there is no gelato of surpassing excellence in all of Sardinia, merely that I happened not to stumble across any during nine days of cycling around the island. There is an Amorino in “the Village at Corte Madera” shopping center in Corte Madera, Marin County, California (San Francisco Bay Area). New Zealand: Auckland: Giapo. 279 Queen St, near Wellesley St.
Gianpaolo Grazioli makes expensive, baroquely overdecorated gelato that is so worth it. Also has sorbet and ice cream. Iorio’s Gelateria in Ann Arbor, MI, dyes their rose gelato pink, but when I was there did not dye their fruit flavors, which were lovely. A few weirdo flavors for those who like that sort of thing, a bunch of really solid flavors for those who love the basics. I see from your list of gelateria’s across the globe that you haven’t yet made it to Argentina. I realize this may be somewhat incendiary a comment, but I think they took the Italian technique and married that to better ingredients (Argentinian pampas-raised beef is famous for flavor, and that quality is also seen in the milk). I had far better gelati there than anywhere in Italy, though I don’t think I’ve tried any on your Italian list, to be fair…. Thrilled to hear that gelato in Argentina is great! If you want to recommend some specific gelaterias in Argentina we’d be delighted to add them to the atlas — the goal is to help people find great gelato wherever they find themselves. I have a good gelateria in Brownwood texas 76801 The Turtle Gelateria 514 Center Ave, Brownwood, TX. Please add me to your atlas. Please add Gelateria del Monte near the Vatican in Rome. Massimiliano Del Monte founded it by inveigling a well-known but retired maestro of the craft to give him his recipes and thus resurrect in spirit one of Rome’s more beloved gelateria (whose exact identity, alas, remains a secret). At least that’s the rather florid story I translated for him on his website. I can attest from arduous personal consumption that the product is indeed heavenly, and gets high praise from visitors. Most importantly, I have a picture of myself behind the counter scooping as if I were the very proprietor himself. We are fortunate to live less than one mile from Basilico. Billing itself as a New York-style deli (that I’ll not judge), Basilico offers most days up to 12 gelati. My favorite happens to be nocciola and theirs compared quite favorably with the gelati I enjoyed in Trieste at Marco’s and at Natural Ice Cream (sic). Basilico’s makes their gelati on premises and on a daily basis with the kitchen turning out more gelati as the tubs run empty. The nocciola’s demonstrates high consistency in terms of the flavor, the density, and the texture (another outfit in DC sells what they bill as Argentine gelato; the texture to my tongue is grainy), which as the expression has it, is smooth as silk. Update on Basilico: Re-reading your recommendation about, call it, all-good-gelati-begins-with-fior-de-latte, during today’s gelato run, I inquired of my favorite server, Giosefina, if she knew “milk gelato.” Smiling, she thought, then said, “Ah, fior de latte.” I asked if they ever served it. Saddened a bit, she said no, then adding that most people are not familiar with it and therefore with virtually no market they cannot afford to add it to their gelato menu. So, I ordered my usual nocciola, while hoping the word about fior de latte would begin to spread. I can hardly believe that Antica Gelateria di Roma [3 Pharmakopoulou and, Michail Komninou, Nafplio 211 00] is not on the list for Nafplio. You can easily get it to it from the central part of the city. It may be the best gelato I’ve tasted outside of Italy. The owners of the shop themselves are Italian transplants, so they know their stuff. I personally only tried the dark chocolate, but according to friends it seems that you can’t go wrong with the other flavors as well. I’ve added it — this atlas is places we’ve been, or that people tell us about, like you just told us about this one, thank you. I haven’t been in Nafplion since 1981, so it’s not all that surprising that it isn’t listed really! Delighted to hear there is good gelato there now. I’m just returning from vacation in Italy and I wanted to thank you for your very useful guide to good gelato and contribute a few additions to the atlas. Gelataria Savoia, Via Roma 1/b in Verona. Gelataria La Romana. We went to the one in Ferara but this appears to be a chain with branches eslewhere in Italy. La Vecchia Latteria, Via S. Pietro 10, Siena. Thank you, those are very useful. I’ve added them, and hope to try La Vecchia Lateria for myself when I go to Siena in June. This is an excellent guide for choosing gelato, which is also a passion of mine! I heartily agree with your suggestions, and appreciate the detail. I can’t wait to share it with friends who are new to gelato. I’d like to suggest a gelateria in Paris for your international gelato guide: Pozzetto, at 39 Rue du Roi de Sicile in Paris. It is, to my taste, the very best gelato in Paris, and it produces objectively high quality gelato. It meets all the right criteria – the short list of flavors every day always includes a dull greenish brown pistacchio, and a truly heavenly, must-take-a-moment-to-savor-with-closed-eyes fior di latte. Everything is the right color, which you find out only when they open the metal lids to give you a taste or scoop out your choices. The texture is perfect. They have a walk-up window to sell to passers-by on the sidewalk, and an interior salon. Blessedly, they are open late. A small cone is, as of May 2018, 4 Euros, but it’s hard to resist a larger treat, no matter how recent my last cone. I hope you have the opportunity to try it next time you find yourself in the Marais district in Paris! We ended a walking tour of the Gargano peninsula in Vieste and were of course looking for gelato. After trying several so-so places we discovered Gelateria Artigianale Sotto Zero at Piazza John Kennedy 9. Seriously good gelato of a quality comparable to good places in Rome or Florence. It’s so great to find good gelato like that. I’ve updated the atlas to include it. Thank you for sharing it! Hello! I was surprised to see one particular gelateria missed off of your atlas. When I was on honeymoon in Florence we stumbled upon a place called Gelateria della Passera and frankly it blew our minds. We went back every day, sometimes twice a day, the whole trip. It was just incredible. Freshly made every day, daily changing flavours, seasonal, bins under the counter. Best flavours we ordered were dark chocolate, coffee, fior de latte with mint, and every single fruit sorbetti we tried (strawberry, melon, lemon, raspberry, and fruita de bosco). An incredible place, and I’d love to see you review if you got the chance! It is in there, as Della Passera, under Florence, you must have missed seeing it. It’s been there since we found it in the summer of 2016 when we stayed nearby. Best gelato south of the Arno for sure, and very reasonably priced. Glad you found and enjoyed it.